Whether you’re a business, developer, hospital or university, a custom sign is an important asset in a branding strategy. 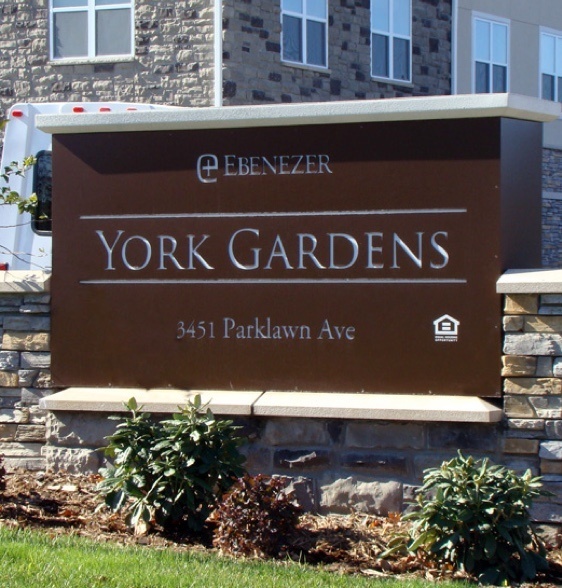 Custom signs serve many purposes, from landmarking, to marketing, to a cost-effective advertising platform. That’s why, when designing a sign for your business, you want the best. Read this guide to learn the importance of custom signage and how to get started creating one for your business needs. There is undoubtedly a firm connection between quality custom business signs and positive consumer interaction. A custom sign can add to the overall cohesiveness of your brand. By using your logo, signature typography, colors, and other graphical accents, you benefit from customers who recognize your brand. A small business’ sign can also be an influential word-of-mouth marketing tool, with three out of four consumers saying they have told someone about a store based simply on its signage, according to a survey by FedEx. Beyond recognition, the quality of a sign can enhance your branding, as well. Nearly 7 out of 10 (68%) American consumers have made assumptions on the quality of products or services based on the business’ signage. According to the same survey, 76% of American consumers have entered a store they have never visited before based on its signs. Conversely, nearly 60 percent of consumers say the absence of a sign has stopped them from entering a store—which means businesses are leaving money on the table by not having adequate signage. Considering these statistics, it’s obvious how important a sign could be for your marketing. In addition to attracting people to your storefront, quality signs also lead to purchases. FedEx found that about 68% of Americans have purchased something because a sign caught their eye and encouraged them to visit the store. There are few other types of advertising that put in as much work for you as a sign does. A custom sign is a 24/7 salesperson for your brand; it requires no outreach or interaction from your company, and the best part is, you don’t have to pay it a salary! The ROI on a sign is worth it: your business could see up to a 10% increase in sales by adding or replacing your signage, according to a study by the University of Cincinnati. Advertising (whether it’s going through TV, radio, newspaper, or your business sign, is universally analyzed in terms of “cost per thousand exposures,” or CPMs. So, whether you’re analyzing the ROI of your newspaper advertisement or your custom business sign, consider answering the following question: How much are you paying for 1,000 people to see your advertisement? The cost of maintaining your sign for years to come is minimal compared to the value you’ll receive from your custom business sign. A sign can last you up to a decade if properly maintained. And today there are more options than ever to reduce the costs associated with your sign. Ultimately, there’s no other form of advertising that you can pay a one-time fee (plus maintenance) and reap the benefits for years to come. Signage can most effectively and affordably help a business tie its other forms of advertising together, and communicate to its target audience (those actually moving through its trade area). In fact, without a sign to identify a business location, the money spent on other media is largely wasted since, as mentioned above, signage greatly impacts the flow of traffic to your location. The important role signage plays in your business’s success has spurred an incredible evolution in the sign industry, ensuring the availability of attractive, customizable options to suit the communication needs of any business, no matter the industry. Have you ever looked for a store, and you couldn’t find it due to insufficient signage? According to a study by the University of Cincinnati, 50% of people have had that problem in the past. A sign will make it obvious to any passerby where your business is, so there’s no question of how to get there. Location is extremely important. Think about it: where you place your signage is where you will be branded. The people who drive by will begin to know who you are, what you have to offer, and also become your local clientele. So even if someone doesn’t need your goods or services now, that doesn’t mean they won’t in the future. And when they do, you want them to remember your brand, not your competitors’. Take fast food restaurants as one example—they’re known for their unmistakable signage. It’s been widely circulated that McDonald’s spends, on average, $40,000 on signage for every store. That may seem like a lot (and it is), but it’s because studies have shown that their $40,000 can generate up to $600,000 in sales. A recent survey (over 10 years) of businesses who had installed a new sign looked at where their new customers are coming from. A whopping 45% of those new customers said they came into the business for the first time because of the sign. Wayfinding signs can help direct your visitors around your campus or headquarters, especially if your business is housed in many buildings or wings. Being cognizant of your visitors’ needs will be important in return visits. If it’s difficult to navigate your campus, or worse yet, they can’t even find your business at all, there’s a slim chance they’ll come back. When it comes to wayfinding, there are different needs and strategies, based on industries and goals. Healthcare systems need to get patients, visitors and staff to the right place fast, without turning a stressful situation into an even more stressful situation. A mall or large retail development needs to direct shoppers to the store they’re looking for. Whatever the wayfinding goals, signage can give visitors peace of mind and direct them to where they need to be. How Can You Customize Your Business Sign? Each business sign should be unique to your business needs, therefore, no custom sign is created equal. From branding, to sign type, to location and more, the customization options are endless. A specialist will take you through all of your options and how they work with city zoning codes and the effectiveness of your choices. With every choice, you should be aware of how it will affect visibility. If no one can see your sign, it won’t be effective. The most obvious way you can customize your business sign is the content on the sign. Including your own business name, logo and message (If LED electronic messaging system) on your sign can let passerby know where you’re located and promote brand awareness. Because most people are reading signs while driving, you only have a few seconds to grab their attention and deliver a message. 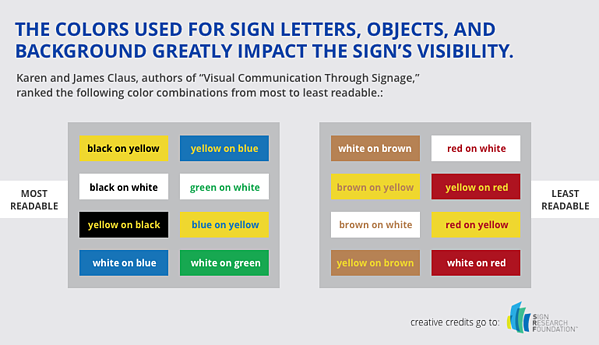 Because of this, make sure your sign doesn’t use hard to understand words or graphics, or lengthy messages. Include your name and brand colors, to make it easy for passerby to identify your business from afar. Color is one of the most important aspects of your brand. According to a study by ColorFast, 80% of those surveyed said color increases brand recognition. For example, what do you think of when you think of McDonald’s? The yellow golden arches with a red background? More often than not, a customer will associate your brand with its colors. Furthermore, your brand colors evoke emotions within your customers, patients, and visitors. According to a study by Emerald Insight, “People make up their minds within 90 seconds of their initial interactions with either people or products. About 62‐90% of the assessment is based on colors alone.” That’s why a custom business sign should allow you to use your brand colors however you want. When it comes to visibility, color also affects luminance. 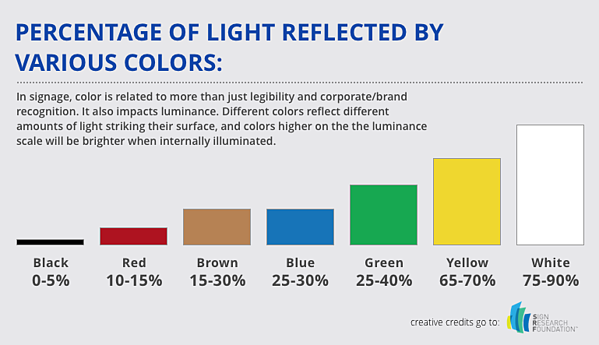 Different colors reflect different amounts of light when illuminated by the sun. The more light it reflects, the brighter the letters will be. White letters will reflect 75-90% of its light, but black letters will reflect 0-5%, as shown in this graph. A designer will walk through the best colors to use for visibility and brand recognition, so your sign isn’t confusing or hard to read. Another key element of your brand is the typography. What would the IBM logo be without its font? Your font says as much as what’s written in it: it can be big and loud or soft and flowing. The typography enhances your brand, and a custom sign allows you to use your brand’s fonts, therefore promoting brand recognition for customers and potential customers. Another, more important aspect of typography is readability. To get the most out of your sign, you’ll want passerby in cars and on foot to be able to comprehend your sign. According to “Typography, Placemaking and Signs,” a white paper by the Signage Foundation Inc., consider these factors when thinking of typography: negative space, letter height, open counterforms, upper-case/lower-case, and serif vs. san serif. According to “Arts and Science of Sign Design,” for maximum safety and readability, a sign must be detectable, conspicuous, legible and comprehensible. In a survey on what makes a sign hard to read, 83% of respondents said, “letters that are too small.” So the larger the letters appear, the better. It’s recommended that the letter be one inch tall for every 25 feet of distance. And for the best visibility, the thickness of the letters should be one-fifth the letter height. A sign designer can help you with the typography, as they know what’s easy to read and what size font a sign needs for peak visibility. The type of sign can dictate its effectiveness, that’s why with a custom sign, you can choose which sign type is best for its location and business objectives. We’ll discuss the various sign types and considerations at length below. Depending on the desired look and location of your sign, you’ll want to explore different material options. From natural metal to wood to illumination, the materials of your sign add to the overall appearance and longevity. Thinking about the materials in the context of the location is important, as well, considering application methods and environmental factors like snow, rain, wind and more. Being cognizant of these factors will allow you to get maximum use out of the sign. Your contractor will have considered these factors, and will review the best materials for your climate, longevity and appearance, based on your unique situation. The location of your sign is extremely important, and if it’s hidden behind a tree or can’t be seen from a certain angle, you’re losing potential revenue. Drivers have a very narrow cone of vision. A sign needs to be in this cone in order for the driver to clearly see it. According to “Arts and Science of Sign Design,” the clearest viewpoint a driver has is a three-degree cone around where the eyes are focused. Talking to an expert about the best location for your sign is a must, as you don’t want to make assumptions that will risk the visibility of your sign, or violate city codes. You also need to consider size restrictions where you post signs. Some cities are banning billboards in certain locations. In addition to local and state laws governing the size of signage, you also have to contend with federal regulations related to outdoor advertising. A customized LED sign can attract visitors to your place of business day and night. An electronic messaging system allows you to send a customized message to your audience. If you’re a restaurant, you can display the specials. If you’re having a sale for two weeks, you can advertise it for those two weeks and display a new message after the sale is done. Not to mention, the cost per thousand (CPM) of views is miniscule compared to other forms of advertisement. According to a study by the SBA, the CPM of a newspaper advertisement, for example, is $7.39. In comparison, the CPM of an electronic messenger system is less than $0.45. Notably, if you’re already planning on using lights in your sign to keep it lit at night, LEDs are a cost-effective option that many sign companies offer. Not only do they last longer (25 times as long!) compared to regular bulbs, they’re also less expensive. Illumination can give your business a competitive edge. A study by Villanova University surveyed 750 business owners. They agreed that their lighted on-premise sign created a competitive advantage for their businesses (5.7 out of 7 on a Likert scale). A pylon sign is a tall, freestanding sign that marks your business in high traffic areas. Pylon signs allow cars and other passerby to see the sign from afar. Monument signs are usually found at the entrance of your campus or headquarters. They’re used to promote your brand and give a good first impression to visitors. Have something more to say? Digital messaging boards are great for displaying a dynamic message on a pylon or monument sign. LED illuminated signs are visible both day and night. If your business operates at night, an LED sign can make your logo and custom message stand out from the others. If your campus is big, a wayfinding sign can help you direct visitors to the right place. A custom wayfinding sign can be functional and bolster your brand. An interior logo sign in your lobby or boardroom can make your space look professional and promote the cohesiveness of your brand. Cabinets and plaques affixed to the wall on your building can be a way to get customers into your door. Customizable colors and materials can make your sign stand out. When making decisions based on your company signage, there are laws and regulations you must adhere to. Usually the regulations change based on your state, city and location of your sign. Your sign contractor should know, or be able to find out, the regulations. Governments can make restrictions in one of two ways: restricting all advertisements, without regards to its content or restricting signs based on the content or imagery within the advertisements. Oftentimes, governments decide to do the former, because the latter could cause legal issues with First Amendment rights and commercial speech laws. Is the speech protected by the First Amendment? Is the governmental interest in restricting the speech substantial? Does the law directly advance the governmental interest? Is the law narrowly tailored? An administrative approval, dictating whether the sign meets the standards of the sign code in the city or state in which it will be installed. A design approval, dictating whether the aesthetics of the sign are acceptable, in relation to the sign’s location. This will most likely take longer than the first round of approvals, as it’s more subjective. The municipality will have you submit a number of items for consideration when reviewing your permit application. For example, Saint Paul’s permit application requires lot dimensions, location of proposed signs, location and square footage of all other signs on the property, and more information for the city to be able to make an informed decision. If your permit is rejected, you can apply for a variance, or an exception from the sign code, based on a justifiable reason. Each municipality will have a different way of determining whether or not you can get a variance. For example, Saint Paul’s Board of Zoning Appeals, a seven-member board appointed by the Mayor, considers these requests. If they were to grant variance, the sign must adhere to a list of requirements, pass an inspection, and a vote by the board. Sign ordinances change often, so one day your sign is in compliance and the next day it isn’t. If your signage is required to change immediately by your local government, then it can be considered “taking” under the Fifth Amendment. Therefore the government would owe you money for the updates or removal of your sign. If it’s not necessary to update the sign immediately (which happens in most cases), the sign will be considered “non-conforming” for a period of time. This period of time is known as the “amortization period.” Your local government will give you a date by which it’s required to be updated (usually a couple of years or more) and then it will be the company’s job to pay for the updates. If the updates aren’t made within the specific period of time, the government can force the takedown of the sign. These regulations will affect your custom sign, and it’s better to find them out sooner rather than later. You want a company with a team of experts, who know what they’re doing and are good at it. When narrowing down your contractor options, make sure to ask about their experience, especially when it comes to the type of sign you’re planning on implementing. Get a quote from each contractor you’re considering before making a decision. Some may be within your budget, and some may be charging more than you can afford. When reviewing the quotes, make sure that you are comparing apples to apples—are the materials quoted the same? While some companies may give you a higher quote, it’s important to think about the longevity of your sign. If the quote is low, the company may be using cheap materials, and your sign may need more repairs and will need to be replaced sooner than a company who uses sturdier materials. Quality signs are an investment, so decide on a number that you’re comfortable with, but make sure you take into consideration the ROI a custom sign will bring your business. Discuss the process with each contractor you’re considering. Understanding the process will highlight which contractors are the most thorough and will value your feedback and include you in every part of the process, to ultimately provide the best outcome for your project. What’s the timeframe you want the job done by? Discuss any time constraints with the contractors you’re considering. A custom business sign takes time to effectively plan and fabricate—allowing the contractor an adequate amount of time will ensure successful sign implementation. Verify that the contractors you’re considering are in good legal standing and have no outstanding claims against their business. Check out their reviews on Facebook, Google, or other websites. When meeting with potential contractors, ask the hard questions. Your business wants a sign company that has a good track record—it’s worth the time upfront to avoid issues down the road. What Can You Expect During the Process of Customizing Your Business Sign? A consultation with a sign technician is the first step in the process. It’s important to talk with an expert about your goals and expectations for the sign. That way, the sign technician can get to know your business a little better and start thinking of how best to represent your brand on a sign. A site survey will let your sign technicians better understand your property, and where a sign will do the most work for you. They should also review zoning codes and understand where a sign can be legally placed, so they’re prepared when they arrive on site. The site survey is a vital step in the process, and will give the sign company insight into the rest of the process. Next, it’s time to design your sign. Designers with an expertise in signage are visionaries when it comes to knowing how a drawing translates into a sign. The designers should pay attention to not only how it looks, but how it will function. Taking sightlines, placement and materials into consideration, the final step should be showing you how it looks on architectural software. Once the design has been approved, your sign heads to fabrication. Taking design, materials, city codes, and everything else agreed upon earlier in the process, the team should build a finished product that exceeds expectations and will last you for years to come. During the site survey, the team should develop a plan for the appropriate materials and methods to attach the sign. This is extremely important, because proper installation leads to the best results and sign longevity. Installation sometimes requires cranes, aerial trucks and heavy equipment, which should be coordinated by your sign contractor. Over time, your sign will experience wear and tear, from being exposed to the elements. A good sign company should have a maintenance team that can update finishes, paints, electrical equipment and more, so your sign will always look as good as new. Ready to get started creating a custom sign you can be proud of?